Kal Technologies is your barcode services specialist. We are resellers of Nicelabel software and Impinj RFID systems, Zebra barcode Printers , blank labels and pre printed bar code labels. We develop custom barcode applicaions. We print the finest quality barcode labels at the most competitive prices. All of our barcode labels are generated using top quality materials and then verified to insure proper scanning. 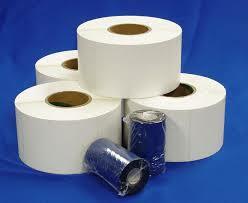 Thermal transfer paper labels are ideal for many general purpose barcode labeling applications. We also feature a wide assortment of other thermal transfer paper labels with different topcoats, adhesive formulations, and liner options.For many general purpose labeling applications, a paper label can provide the best balance between performance and price. Kal Technologies is your barcode services specialist. We produce EPS barcodes and are resellers of Nicelabel software and Impinj RFID systems, Zebra barcode Printers , blank labels and pre printed bar code labels. We develop custom barcode applicaions. Pre Printed / 4 Color / Blank Labels: 1.5W x 1L, 2W x 1L, 4W x 3L, 4W x 4L, 4W x 6L We print the finest quality barcode labels at the most competitive prices. All of our barcode labels are generated using top quality materials and then verified to insure proper scanning. Develop custom label design and printing solutions that meet your business needs. The Globally Harmonized System of Classification and Labeling of Chemicals or GHS is an internationally agreed-upon system, created by the United Nations. GHS requires manufacturers, importers, downstream users and distributors of chemical substances and mixtures to adopt the standard by 1st June 2015 in EU and December 2015 in USA. GHS is set to unify communication of hazardous products and replace existing country specific regulations. The GHS label template The standardized elements included in the GHS label are 1. Product identifier. 2. Signal word. 3. GHS pictograms. 4. Hazard statements. 5. Precautionary statements. 6. Supplier information NiceLabel includes a graphical label designer that allows business users to easily design GHS compliant label templates. Data Manipulation Service Converting and cleaning of all types of data files TXT, ASCII , XLS, XML. If you find a better price, we will beat it!